This last summer we finally saved up enough pennies to complete a project that we’ve wanted to do for years. We built a green house on to the back of our country home. Some friends of ours had access to some glass that had been cut for patio doors that had turned out to be the wrong size. The glass panel are double glazed and clear so they were perfect for what we wanted to do. Our friends gave us eight of these glass panels as well as a double insulated single-hung window, and we thought we were well on the way to having a greenhouse. We didn’t want a huge greenhouse, just something about 8ft. by 10ft. We figured that we could knock something like that out in short order. Funny how we can always convince ourselves how easy something will be. • We removed the sod from the area where the greenhouse would be and replanted it. • We dug a 14” wide by 9” deep footing, leveled up our form boards, threw in a couple of rebar, and poured about 30 bags of sackcrete. • On top of the footing we laid a 20” high wall of cinderblocks (the first time I ever laid brick or block, I was amazed that it turned out both level and square to within a quarter inch). • We dug down to a waterline running under the greenhouse and added a faucet inside of the greenhouse. • We framed up the wooden portion of the green house and painted everything. • We screwed on a corrugated clear fiberglass roof and caulked all the seams. • We installed the single hung window on the East end of the greenhouse. • We built the potting benches inside the green house out of treated lumber. 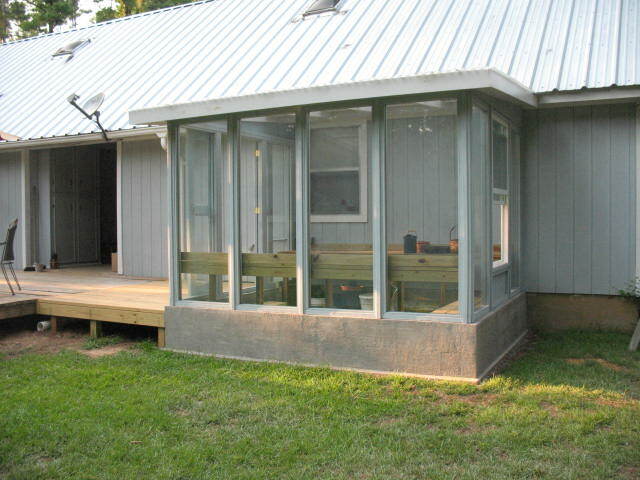 • We built an extension of our existing deck over to the greenhouse. • We built steps down into the greenhouse out of treated lumber. • We laid patio blocks and gravel on the ground inside of the greenhouse. 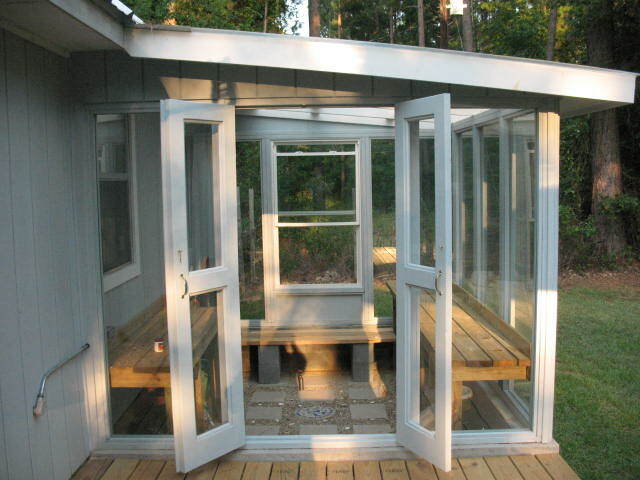 • We built a set of double doors with Plexiglas inserts and mounted them in the West end of the greenhouse. • And last, we installed the glass panels. Pictured Below: The finished greenhouse. It was a lot more work than we had anticipated, and the weather was a lot hotter than we anticipated, and we had to spend more money than we anticipated, but we were very happy with the results. The greenhouse looks like part of our house and not just an add-on. We are looking forward to having fresh hothouse tomatoes this winter, and we will be starting a lot of plants for our spring garden in the new greenhouse.